Software to import, type, process, print and e-File 1099-K Forms and other IRS W2, 1099 and 1098 Forms. Trusted by thousands of users and tax professionals nationwide. Great for cab owners and cab companies. Saves you time & money by printing 1099-K Recipient Copy (Copy B) on regular paper instead of laser forms. Prints 1099K Federal Copy (Copy A For Internal Revenue Service Center) on pre-printed red laser forms. Imports 1099-K data from CSV, Excel, Intuit QuickBooks, Peachtree, Microsoft Dynamics (Great Plains) & DacEasy. Supports 1099 K, 1099 MISC, 1099 C, 1099 B, 1099 OID, 1099-A, PATR, INT, DIV, R, S, 1098-T and 1098 Forms. 1099 K Electronic Filing (1099 E-File) through IRS FIRE System (Fire.IRS.Gov).Complies with IRS publication 1220. Supports an unlimited number of 1099K payers, recipients, printouts and electronic reporting submissions. Complimentary US-based technical support. Buy our 1099-K software Now and Receive Instantly. Form 1099-K is used to report income for payments processed through a merchant account (credit card processing account). An IRS 1099-K form breaks down a company's or a business's sales by month in order to make reconciliation of the amounts easier. The amount reported on the 1099-K does not include charge backs or returns. A payment settlement entity (PSE) must file Form 1099-K for payments made in settlement of transactions for each calendar year, for example 2018 1099-K form is used to report transactions processed in calendar year 2018 only. W2 Mate is a powerful 1099 and W2 software that supports a number of 1099 forms other than 1099-K. 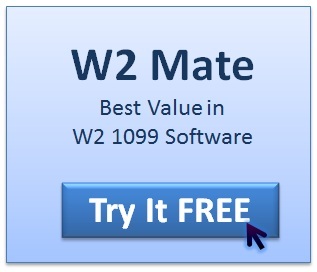 This page is dedicated to 1099-K, to read about the full capabilities of W2 Mate click here . Start printing now...Order our 1099-K Software and receive instantly! Copy B of Form 1099-K : For Payee. Copy C of Form 1099-K : For Filer . Laser Copy A of form 1099 K (Credit Card): For Internal Revenue Service Center. Laser 1096 form : Annual Summary and Transmittal of U.S. Information Returns. As of this writing the popular accounting software Intuit QuickBooks only supports 1099 MISC (Miscellaneous Income) forms. Our 1099-K software allows QuickBooks users import 1099 data and then map it into 1099-K forms with the ability to specify which box the money amount goes to. For example the user can remap QuickBooks 1099-MISC amounts stored under QuickBooks 1099-MISC Box 7 into 1099-K Box 1 Gross amount of payment card/ third party network transactions. PSEs, cab owners, cab companies and transportation companies that use QuickBooks to track 1099K payments can also W2 Mate software to print recipient copies (Copy B), IRS copies (Copy A), e-file through IRS FIRE System and much more. 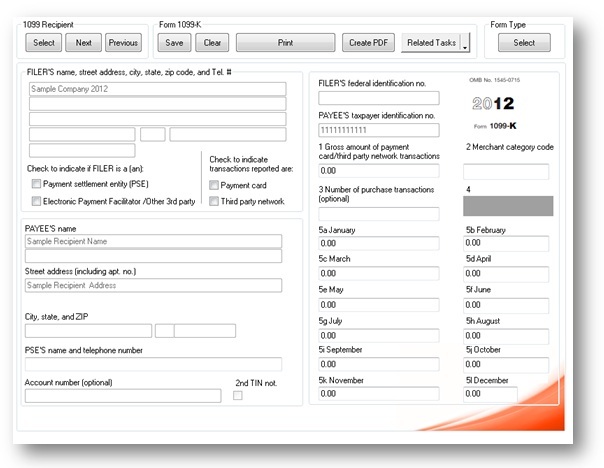 Many financial institutions, payment settlement entities and credit card processing companies use Dynamics, the popular accounting business solution from Microsoft, to track form 1099-K information including Gross amount of payment card/ third party network transactions, Number of purchase transactions, January credit card payments, etc. Since Microsoft Dynamics (GP or SL) does not support printing and/or E-filing 1099K forms, our W2 Mate software can import data from MS Dynamics and then allow the user to print recipient copies on standard white paper, IRS federal copy A on pre-printed forms and if required generate 1099-K electronic filing submission for reporting electronically through IRS FIRE system at FIRE.IRS.GOV. MS Dynamics users can also utilize W2 Mate to create PDF copies of form 1099-K to be emailed to recipients.